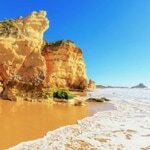 The lure of year-round warmth is just one of the reasons Portugal is a popular choice for families. Most of our luxury family-friendly villas are dotted along the beautiful Algarve coastline, famed for its golden sandy beaches fringed by the Atlantic Ocean. Landmark family celebrations or intimate moments should always be spent somewhere special. Stay in one of our villas and relax in your private infinity pool overlooking the sea or one of the region’s famous golf courses. Our collection ranges from spacious standalone family villas to resort homes with access to restaurants, bars, shops and activities. This is perfect for a multi-generation family holiday or a party of friends travelling together. Allow our exclusive concierge to do all the work as you rest and play. Our experts have hand-picked some of our best villas for you to choose from. The delightful five-bedroom Quinta Nautica works for all ages, from the children’s play area to heated pool. Plus, should you have a larger party, it’s also possible to book its sister property, Villa Moda. Sporty families will love the location of the spacious Quinta da Alegria which is five minutes away from Nick Faldo’s Amendoeiras golf course. Six-bedroom Quinta Pienzavilla is ideally located in the heart of Quinta do Lago, the Algarve’s most exclusive golf resort, where you’ll find activities to keep the whole family entertained. Safira do Mar is an oasis of calm in the Portuguese countryside. This luxury villa comes with two swimming pools and is set in a garden of cypress trees. Explore our full range of luxury villas in the Algarve and the latest special offers.